Published Saturday, April 9, 2016 · 268 words, 1 minute read. I took my Lenovo Edge 2 and joined the master race by switching to Linux. Kubuntu 15 was the distro I chose because KDE looked friendly and Debian is easy to use. Here’s some documentation on how you can do the same to your machine. What on earth is EFI? (U)EFI stands for the (Unified) Extensible Firmware Interface. It’s a firmware on most recent computers past 2010. It replaces the traditional BIOS firmware that’s on earlier machines. 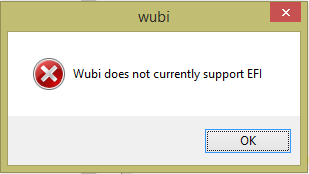 Wubi doesn’t support this (yet?). This and some other Windows black magic crap, like Secure Boot, makes booting Linux annoying, but not impossible. Rufus is a utility that acts a lot like UNetbootin, yet it boasts being much faster and more advanced. Since version 1.3.2, Rufus supports UEFI! Simply download the ISO you want, and run Rufus. I booted into my newly created loader and Kubuntu came right up!